Scientists in Europe had an ideal pig model for colon cancer, but importing the animals presented a problem. It would be prohibitively expensive and time consuming, and the method European scientists used to develop the pig took several years and cost a great many Euros, Amos-Landgraf said. Those obstacles might have been enough to scuttle the project entirely, but CRISPR, a new gene-editing tool discovered in the DNA of a peculiar bacterium, has changed the equation for scientists everywhere. CRISPR is rapidly reshaping the way biologist around the world do their jobs. At Mizzou, it’s transforming how researchers learn about viruses and mosquitoes, pigs and zebrafish, and the individual genes affecting development, sickness and health. The tool makes research more efficient, cost-effective and vastly more powerful. Amos-Landgraf knows firsthand just how time-consuming and laborious generating an animal model was pre-CRISPR. CRISPR rolls off the tongue far more readily than its unabbreviated equivalent: “clustered regularly interspaced short palindromic repeats.” The name refers to a strange pattern scientists at the University of California, Berkeley noticed in the genome of a bacterium that lives in acidic, abandoned mines: groups of palindromic bacterial DNA sequences interspersed with segments of viral DNA. It turned out that the genetic snippets were relics of the bacteria’s prior run-ins with viral invaders, like genetic mug shots on a most-wanted list. Viruses are tiny packages of genetic material that hijack cells, such as bacteria, in order to reproduce. And when a virus enters a bacterial cell, the host compares the virus’ genetic material to the snapshots preserved in the bacteria’s own DNA. If they match, the bacteria dispatches a bounty-hunter protein called Cas9, which tracks down the virus and slices its DNA in half at the very spot that matched the virus’ genetic fingerprint. If an unfamiliar virus attacks and the bacterium survives, it will incorporate a segment of the invader’s DNA into its own, adding a new battle scar to its DNA and a new miscreant to the most-wanted list. When the researchers studying the bacterial immune system figured out how it worked, they realized the process could have implications far beyond the organism’s acidic abode: It could become a powerful, inexpensive, and versatile gene-editing tool. The journey to better manipulate genes has been a long one. For decades, scientists relied on various techniques and tricks to tease out the function of genes. The most common tool is forward genetics, where a researcher starts with an interesting characteristic in an organism and then hunts for the gene that caused it. Those characteristics could be traits that occur naturally, such as genetic diseases in purebred dogs or pigmentation in corn kernels, or a scientist could induce defects — essentially altering an organism’s genome by exposing it to a bath of nasty chemicals. Imagine that an organism is like a car, suggests Anand Chandrasekhar, a Bond Life Sciences Center biologist and professor in the division of biological sciences. Reverse genetics — unsurprisingly — starts on the other end. Researchers pick a gene of interest and try to silence or alter it. If they succeed, then they look for changes in the organism that suggest the altered gene plays a role in the observed characteristic. This tool shaped how scientists do research and what animals they use in their labs. In fact, model organisms such as mice rose in popularity partly because of how easily reverse genetic techniques like homologous recombination work with them, said Amos-Landgraf. But this approach was time consuming, expensive and didn’t function well on other organisms. The next step forward were Zinc-Finger Nucleases (ZFNs) and Transcription Activator-Like Effector Nucleases (TALENs). Both act like guided missiles to strike at a gene of interest, targeting a specific region of genetic material and breaking both strands of the organism’s DNA at that spot. Once the DNA is broken, the cell’s natural repair mechanism intervenes and stitches the gene back together. However, the process is prone to errors — mutations — that can alter or silence a gene. ZFNs and TALENs reliably worked in a broader array of species. CRISPRs represent the next advancement in this process and is far faster than previous techniques. At MU’s NIH-funded Rat Resource and Research Center (RRRC), scientists think CRISPR will help break dependence on default model organisms. The RRRC is the only center of its kind in the US and one of two in the world, serving as a repository and distribution center for rats that model human diseases. Zebrafish are another model organism that might become even more important thanks to CRISPR. Originally found in the rice paddies and streams of India and Myanmar, the minnow-like fish is an important model organism. They’re easy to care for, produce abundant offspring and — because their embryos are transparent — make great tools for studying development. 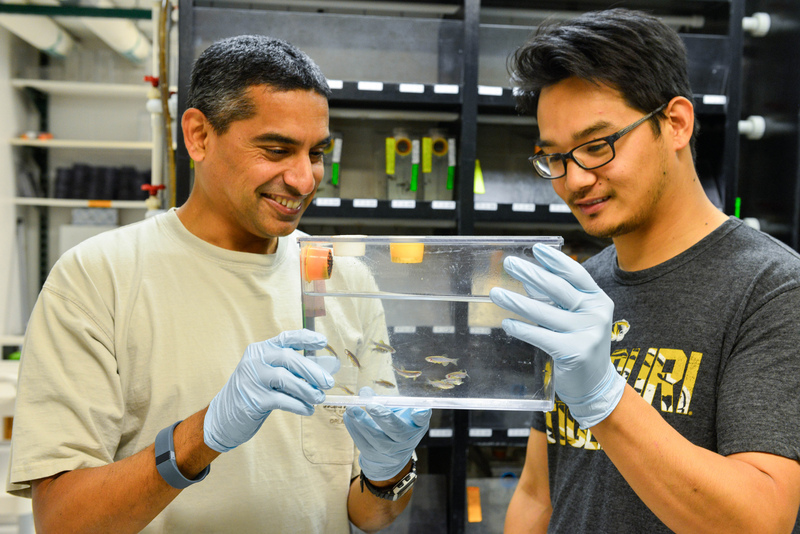 Chandrasekhar uses zebrafish to study cranial motor neurons, the neurons that connect to, and control, muscles in the head. His lab is especially interested in the way those cranial motor neurons are deployed during development: how the neurons know where to go and to which muscles they should link. Researchers have identified hundreds of new and potentially important genes using advance genomics, but the old techniques of reverse genetics were too slow and tedious to keep up with the new discoveries. But finding a new gene is just the beginning, Chandrasekhar said. Although scientists primarily use CRISPR as Chandrasekhar does, to silence genes in model organisms, new genes can also be introduced. Through a process called homologous directed repair, scientists select a location where they want to introduce a gene and design a CRISPR to target that region. 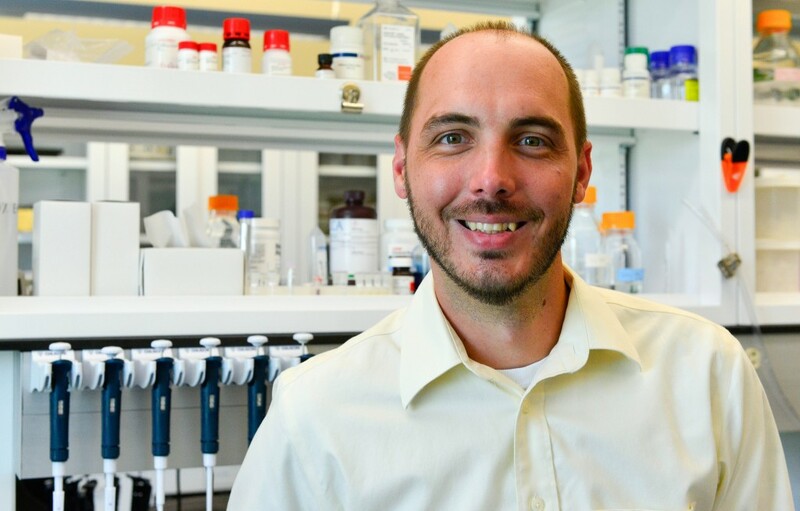 Daniel Davis, a PhD candidate and lab manager for Assistant Professor of Veterinary Pathobiology Catherine Hagan, is developing a technique to screen potential antidepressant drugs by leveraging CRISPR technology and the advantages of the zebrafish. When a zebrafish is stressed, it produces a neurotoxic compound, but when the fish is calm, it produces a different compound, one that is neuro-protective. The difference depends on which key enzyme the fish produces — in a stressful situation, the fish produces more of the enzyme that leads to neurotoxicity. Davis is using CRISPR to try to link different fluorescent proteins genes to each branch of this stress pathway: If the fish produces more of the stressful compound, it will also produce a red fluorescent protein. If the other pathway is taken, the fish will assemble green fluorescent protein. 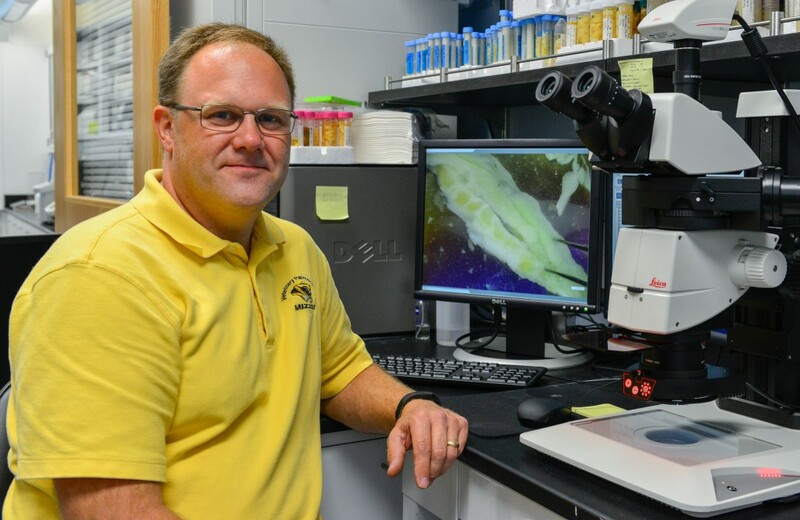 “If you take some fish, subject them to a stressor and test a variety of potential therapeutics on them, you could visualize the fluorescent proteins to see which therapeutics are more protective,” Davis said. Other models present special challenges. In mosquitoes, for instance, it’s hard to knock out genes from its genome using traditional methods. “The problem is that in mosquitoes such as Aedes aegypti, ‘traditional’ knockouts never really worked, so people tried out new techniques such as ZFNs and TALENs,” said Alexander Franz, assistant professor of veterinary pathobiology at MU. But the other techniques had flaws, too: they were expensive, complicated to assemble and often posed issues of efficiency and specificity. Franz studies arthropod-borne viruses (arboviruses), specifically dengue virus and chikungunya virus. The life cycle of an arbovirus requires its circulation between arthropods, such as mosquitoes, and vertebrate hosts, such as humans. Because vaccines exist for only a few mosquito-borne viruses — yellow fever and Japanese encephalitis, for example — people usually rely on conventional and often ineffective environmental controls to thwart disease: bed nets, the elimination of breeding areas, insecticides. Franz is pursuing a different avenue for protection that uses genetic manipulations to interrupt the transmission cycle of a virus in the mosquito. This is where CRISPR comes into play. “When people started reporting using the CRISPR system for genome editing in Drosophila or zebrafish, we immediately had the idea to try it out in mosquitoes.” Working with two postdocs, Franz demonstrated for the first time that the CRISPR system was capable of disrupting genes in mosquitoes. To do so, he started with a line of transgenic mosquitoes that had already been modified to produce red and blue fluorescent proteins in their eyes. The lab designed a CRISPR to silence the gene responsible for the blue fluorescent protein. After trying a few different methods, they found a technique that turned off the target gene when they injected the CRISPR into mosquito embryos. Because it is a very powerful and easy-to-handle genome editing technique, CRISPR has been recently utilized and further developed by other groups studying mosquito-pathogen interactions. 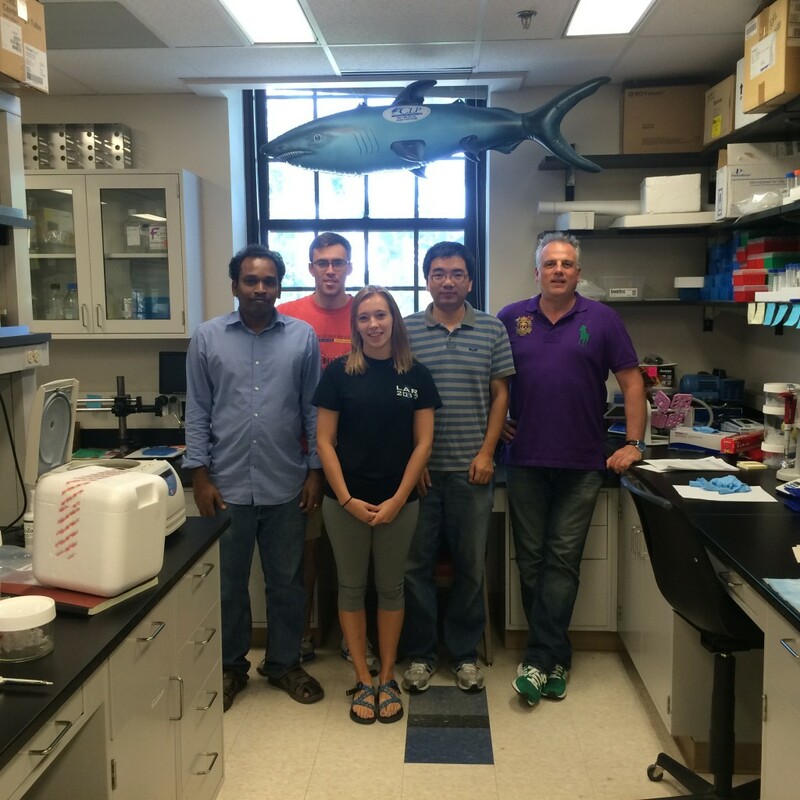 Other MU researchers focus on the viral interaction with human host cells. 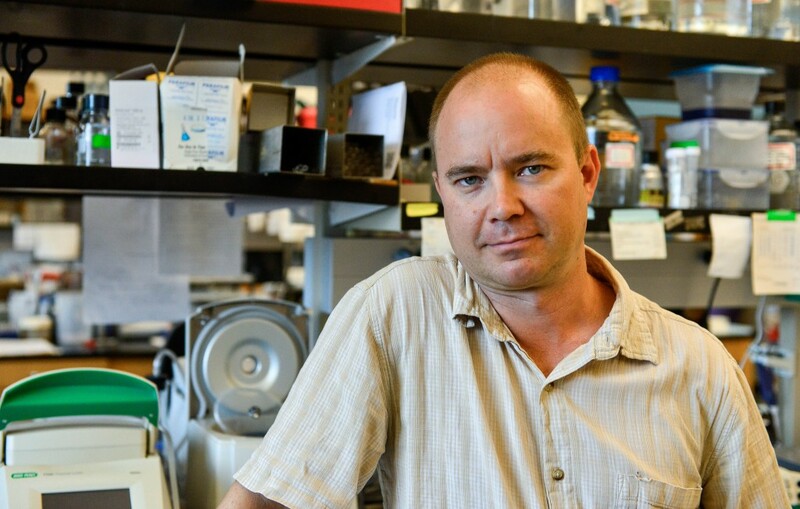 Marc Johnson, associate professor of molecular microbiology and immunology at the Bond Life Sciences Center, studies the way a virus puts itself together inside a host cell and fights off the cell’s defenses. 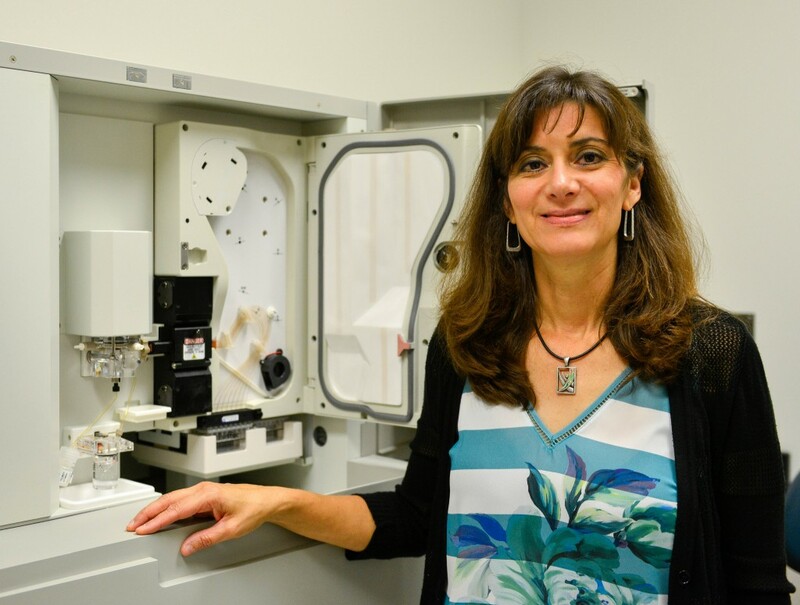 Amos-Landgraf and the researchers at NSRRC are still in the process of validating their pig model: developing primers to identify the mutation and creating the CRISPRs themselves. Once everything is ready, they’ll test out the lesion-detecting colonoscope, and if all goes well, move into human trials — far faster and more economically than would have been possible a few years ago. But Amos-Landgraf is tantalized by the possibilities the technology offers beyond increased speed and reduced costs: “To be able to tease apart not just a single gene in a pathway, but maybe think about knocking out or altering all the genes in a pathway and looking at combinations of those pathways… You can start thinking about multiple gene knockouts, multiple gene manipulations all within the same experiment,” he said.